Dragonfly Mandarin is one of not many Asian restaurants on Randolph Street. After arriving to the nearly empty restaurant, we were seated quickly and given these two tablets (see picture below) which allowed you to order your meals, play games (at a cost), and see pictures of some of the entrees. It was an interesting technology application, but I thought it was more distracting than useful. My parents received a coupon that gave us an appetizer, a sushi roll, and an entree plus two drinks. I was so happy that we had a coupon because the food was absolutely awful. All of the seafood dishes were not fresh and had a fishy flavor. The rice was overcooked and crunchy. And, the descriptions of their items were misleading. The restaurant was very dark and not very welcoming. The prices were steep especially for poor quality Chinese food. I am so glad we had a coupon, otherwise I don't think we would have ever came here. Do not eat here... just head to Chinatown for a better meal at a third of the cost. before ordering. Great concept, but also distracting. Everyone loves pot stickers and the Koo-Teigh dish at dragonfly is a fancy name for pot stickers. Our coupon covered one of their appetizers so we chose these pork and vegetable dumplings. The dumplings were first steamed and then pan fried on one side to give it that crunchy and chewier outer shell. It is served with both a soy ginger sauce and a chili sauce. The pot stickers were nothing unique. They were better when using the soy ginger sauce. The salt and pepper wings at Dragonfly were actually pretty good. They were fairly large wings that were quickly fried making them real crispy. There was a mixed pepper garnish. Unfortunately, the wings were not uniform with some being much bloodier than others. Good flavors, but only an OK execution. The scorpion roll was part of the coupon as well. It was one of their signature maki rolls that was filled with shrimp tempura, soft shell crab, avocado, cucumber, and a spicy mayo. The entire roll was then topped with unagi and was shaped into a scorpion looking roll. The presentation was creative with the claws of the scorpion being the claws of the soft shell grab and the stinger being the tail of the tempura shrimp. But, the presentation couldn't hide the fishy flavor that was present. It didn't seem fresh at all which began the trend that followed the rest of the seafood dishes we ordered. This was awful. First of all, the crab was not fresh at all and the meat inside the crab legs was basically non-existent. It was cooked in a garlic, ginger, and scallion sauce with plenty of cornstarch to coat the shells. The description does say "shelled" which was misleading because the shells are still present and for some reason soggy. I think they weren't cooked at a hot enough temperature which made the shells soggier and almost impossible to break. Do not order this dish. Luckily it was the coupon entree we chose. Another dish with seafood and another disappointment. The happy family is a combination of "king prawns", scallops, steak, chicken, crab claws, and chinese vegetables in a brown sauce. Most of this description however is false. It is hilarious when a restaurant claims a dish has king prawns and the dish comes out with the smallest shrimp I have seen in a while. You could tell they were frozen at some point. Then the dish states crab claws which I think we had one that was probably left over from the crab dish we ordered. And then they describe the dish with steak, which was basically some cut of beef chopped thin to be nearly non-existent. The chinese vegetables included broccoli, carrots, and undercooked baby corn (what is chinese about that?). Anyway, it comes with either white rice or brown rice which was crunchy due to being overcooked or sitting in the rice cooker for hours. After originally ordering the Mongolian steak, our waiter mentioned this dish and how he thought it was better. We decided to take his recommendation. The Bo Luc Lac is a flank steak that is cut into small cubes and served with watercress and a light citrus dressing. The steak was somewhat tender, but you really need to squeeze the additional limes over the dish to gain the citrus flavor intended. This was the best dish of the night (but that isn't really saying much for how awful or average some of the other dishes were). The fried rice had plenty of duck pieces chopped into small cubes. It had the typical fried rice vegetables and was topped with a fried egg. Cooking the rice this way at least eliminated the crunchiness from the overcooked white rice that came with the rest of the dishes. Also covered by the coupon, this drink was a guava rum mixed with guava juice, pineapple juice, lime juice, and mixed with a few chunks of some kind of fruit. The alcohol content seemed very minimal and the guava juice was the only flavor actually tasted. The chunks of fruit at the bottom had an interesting chewy consistency. - The fried rice is the best option here... so if you decide to come, don't miss out on it. - Valet parking is available for $12. - The ordering system is neat. You can use these tablet style computers to not only order, but look at most of the dishes before ordering. - Don't order seafood here. It is not fresh and definitely not worth the price. 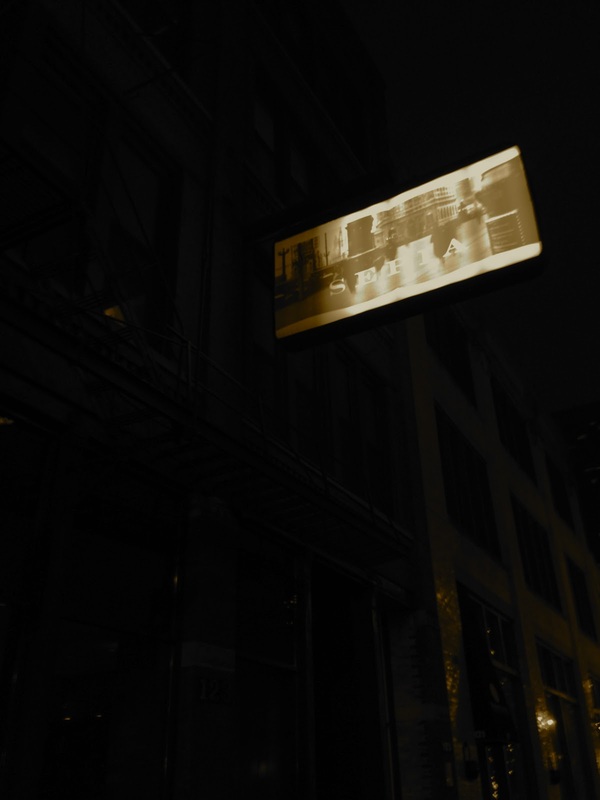 Sepia is one of only 16 restaurants in the city to receive one Michelin star. This rating is reserved for restaurants that have excellent cuisine for their specific category. Sepia is built in an old printer shop so it is full of classic memorabilia. The overall cuisine is modern American that allows the ingredients to shine on their own. Sepia does pride themselves in using organic and all-natural ingredients that are locally sourced. I really enjoyed the food at sepia and would definitely come back if the price was more friendly. As I just mentioned, the price is the biggest factor... it will defnitely set you back a minimum of $50 per person, especially if drinks are ordered. The atmosphere is very homey with wine lining the walls and a very warm lit room. I gave it a 4 mile rating for its great food (with only a few dishes I didn't enjoy), an even better atmosphere, but its not-so-friendly prices for the budget conscious person. The freshly baked flax seed bread that is given after your orders are taken. As you may already know from my previous posts, I am not the biggest critique of drinks but I did still order one at Sepia. The Leap of the Creature is one of their speciality cocktails that contains black grouse blended scotch, cinzano rossa, rooibos tea syrup, malbec, lemon, and burlesque bitters. I honestly don't understand all the parts, but it was a great scotch based drink to start of the dinner. I decided to order the foie gras dish mainly because I rarely get to try eat it. This preparation was an extremely smooth foie gras topped with a sour cherry gelee, which was a gel-like suspension layered on top. It had a few hazelnuts sprinkled on top and was served with a miniature brioche loaf sliced thin. The foie gras was creamy, rich, and lacked the iron flavor that most people associate with liver. The sour cherry gelee was an awesome texture that gave the brioche toast and foie gras a more fresh and tangy flavor. They do give way too much foie gras and not enough bread, but ask for more and they will be glad to bring out a few more slices. The flavors are strong so make sure you enjoy foie gras before ordering this dish. 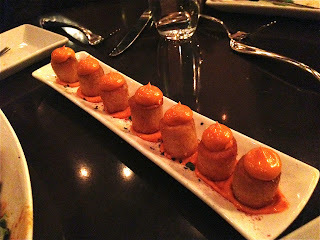 My mom had been to Sepia before and she always raved about their scallop appetizer so it was an obvious choice for her. I believe there were two or maybe three good sized scallops that were cooked with a light sear on each side and still tender in the middle. It is served with a mixed pepper romesco. At first, the ocean flavor confused me, so I asked the waitress and found out that a their romesco was a puree of peppers and spices to make a simple sauce. Lots of depth on the sauce. It was without question the best appetizer of the night. My little brother ordered the grilled calamari for his appetizer. This dish was a huge reminder of a Filipino dish (stuffed squid) my mom makes. At Sepia, however, they stuff the squid with a merquez sausage mixture, giving it a spicy element. In fact, the filling tasted creole-like to me. The presentation was unique--the squid served on a wooden board next time just enough of a tomato jam to add a sweet flavor, but not overpower the squid. I was lucky to grab a bite before it was devoured. The pork belly was the popular choice in my family, but after my dad ordered it, everyone scrambled to choose something else. It was a simple preparation of pork belly with a little honey glaze and served with flash fried kale. I love the concept of fried kale... it gives a completely different flavor and an awesome texture. The pork belly wasn't too fatty like some places I have had it and the skin was very crisp. This was a very enjoyable appetizer. This was the pasta option that could either be an appetizer or an entree. For the appetizer, it came with about five or six pieces of agnolotti which is a ravioli like pasta. It was filled with robiola which is a soft-ripened cheese and dressed lightly in an olive oil and mushroom mixture. The size of the appetizer was perfect but I wouldn't order it for an entree. It was pretty one-sided in flavor... cheese. My dad decided on this chicken dish that featured chicken in three different ways. The first was a lightly fried chicken breast (skin left on) which was amazing. The white meat was extremely moist and the skin was fried to a perfect crisp. It didn't have much seasoning except for a little salt, which allowed the meat to shine. The second preparation was a chicken sausage sliced in half, grilled, and layered with mushrooms. At first, the sausage appeared to be some kind of plantain side, so the sausage preparation was a huge surprise with good seasoning. The final preparation was a simple take on grilled chicken teriyaki skewer. This reminded me of my family's last trip to the Philippines when we ate at a restaurant called Aristocrat or Chicken Inasal. It was a good mixture of salty and sweet from both the soy sauce and pear preparation. I did think the dish was lacking some kind of starch but I guess that is why we ordered a few sides to share. I decided on the duck breast entree which was without question the worst one of the night. The meal comes with three pieces of duck breast cooked at a medium rare (recommended) and served with so much fennel that the dish starts to taste like licorice. It also came with slices of roasted beets which had a consistency of a water chestnut but much sweeter. I wasn't a big fan of any of the components so I wouldn't recommend getting this dish. My little brother decided to get the steak after also thinking about the Sepia's pork chop. He ordered it medium and they cooked it just as he liked. When it first arrived to the table, the steak was separated from the mushroom and potato side by a distinct strip of white porcelain plate. The waitress then poured the bordelaise or wine-based sauce over the part of the steak and allowed some to spill over to the sides. This was a nice presentation point and was fun to watch. My little brother generously cut a nice chunk of his steak, stacked a mushroom and potato bite on top, dipped it in the sauce, and handed it over for me to try. The steak was cooked medium, it was juicy, and extremely tender. Eating it with the mushrooms was awesome and the sauce to die for. There was an interesting scoop of garlic in the middle of the plate... Spread a little on the steak and enjoy. Highly recommended dish! My mom once again chose the best dish for the entree course. She had the redfish which was lightly pan fried to give it a crisp skin yet still flaky fish texture. It came with a crawfish boudin which was a mixture of crawfish, rice, and cajun seasonings stuffed inside a pork casing which looked like a sausage. The rice was a nice surprise because it gave the meal the starchy component that it needed. It also came with sautéed kale and a white bean and ham puree as the sauce. This was my favorite dish at Sepia. My older brother was between two options and eventually chose the arctic char. Arctic char is a salmon-like fish but in this case, it seemed more tender... nearly butter-like. It flaked with ease and each bite melted in your mouth. It was served with a mushroom and jowl bacon mixture which had so much flavor. Jowl bacon is a pig cheek bacon famous in the South. Overall, this entree was the lightest but was packed with the most flavors. This was the other side option that we decided to try. It was an extremely small portion of mac & cheese but just enough to give everyone a few bites and that starch component to some of the dishes. It states there are three-cheeses, but who knows with such a mixture it was difficult to tell. There was a nice bread crumb crust. I wasn't a huge fan of these potatoes... but I guess I never really am. Duck fat fried potatoes are, in my opinion, a side dish that tastes exactly the same as thick cut french fries at a price that is nearly triple or quadruple what it should be. I couldn't make out any additional flavors and honestly they seemed under-seasoned. I do not recommend these. This was the winner I think for our table's favorite dessert. It was a holiday twist on the ice cream sandwich with gingerbread slices as the base and a passion fruit ice cream center. It came with a highly concentrated passion fruit puree, homemade marshmallows, and a few pieces of the chopped fruit. There is a tanginess to the dessert which made me keep wanting more and more of it. Another holiday classic is bread pudding. Sepia made a cranberry bread pudding with a vanilla sauce and was served with a bourbon ice cream. The ice cream wasn't too alcoholic for anyone's palate... even the ones dislike the taste of alcohol. Another tasty dessert. Now this dessert was easily the richest of them all. The chocolate cake was dense like pure chocolate melted into a bar but had a brownie like consistency. The espresso ice cream had a strong coffee flavor but was still very sweet. There was a salted caramel streak painted on the plate as well. Together this made another great dessert. - Definitely call weeks in advance to secure a reservation with a decent dinner time. I didn't have much trouble making reservations here, but some of the other Michelin-Rated restaurants need months in advance. - Share desserts. They are big enough for a few people to try. - The cocktails are unique and interesting creations so definitely try one. - Personally, I wouldn't order the duck breast ever again.